Dave's Model Workshop: Competition: Subscribe and win an AK Interactive Flesh and Skin Colors Set! 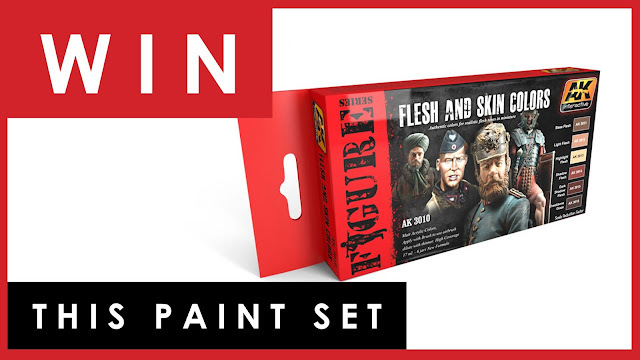 Competition: Subscribe and win an AK Interactive Flesh and Skin Colors Set! Today 17th September it is ONE YEAR since my first blog post on Dave's Model Workshop. Woo hoo! 192 blog posts and 60 videos later, I wanted to find a way to say "thank you" to you all and to celebrate the one year anniversary, so I'm offering the chance for one lucky subscriber to win a brand new AK Interactive Flesh and Skin Colors Set, which contains six acrylic paints specially formulated to paint realistic skin tones. All you have to do to be in the running is be subscribed to my blog by midnight Australian Eastern Standard Time on Sunday 1st October 2017. To subscribe, simply fill in the "Subscribe to automatically receive my latest posts" box at the top right hand corner of any of my blog pages. The AK Interactive Flesh and Skin Colors Set (AK3010) is what I use every time I paint figures. I've written about it before, and how highly I recommend it. It's versatile, the pre-shaded colours can be used as is to give a professional finish to your figures' skin, but you can also tweak the shades yourself to give radically different skin tones - it's not just for painting white European figures. It really does take a lot of the guesswork out of trying to paint authentic skin tones. 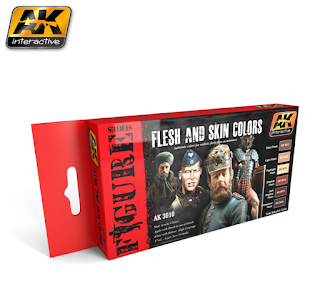 AK Interactive Flesh and Skin Colors Set. It's good stuff. - Source. As I mentioned, to be in the running all you have to do is be actively subscribed to my blog before midnight AEST on Sunday 1 October 2017. To do this, just enter a valid email address in the subscription box at the top right of my blog ("Subscribe to automatically receive my latest posts") and then confirm your subscription via the automatic email you receive. On 2 October I will use a random number generator to chose which person is our lucky winner, and I will then contact them using their email address and arrange postage to them, wherever they are in the world. I will not share a single email address with any third party, apart from my blog subscription software (Feedburner). By subscribing, you will automatically receive update emails when I post new blog posts. That's the only use your data will be used for. It's good stuff, I promise you. No third party is a sponsor of this competition. Facebook, YouTube, etc are not officially endorsing this contest. All subscriptions must be verified (i.e. when you hit "subscribe" you will receive a verification email - you must have completed the action in this verification email for your entry to be valid). All existing verified subscribers are also in the running. Good luck everyone, and thank you for coming with me on this over the last year. It's been a blast, I'm loving it, and hope to bring you tips and videos and ways to save money for many more years. Thanks for the contest! Congrats on one tear!